The Mirage spiked leather dog collar is 100% genuine leather. These awesome leather spiked dog collar are embellished with one row of spikes. 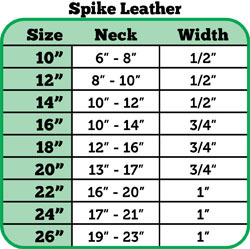 Get a Mirage spiked leather dog collar for your dog today! 10": Neck 6"-8" | Width 1/2"
12": Neck 8"-10" | Width 1/2"
14": Neck 10"-12" | Width 1/2"
16": Neck 10"-14" | Width 3/4"
18": Neck 12"-16" | Width 3/4"
20": Neck 13"-17" | Width 3/4"
22": Neck 16"-20" | Width 1"
24": Neck 17"-21" | Width 1"
26": Neck 19"-23" | Width 1"